Lately I've noticed how dependent I am on my iPhone for pretty much everything; directions, music, Starbucks runs, checking the time. I pretty much can't function without it. In an effort to unplug a little bit more I've started wearing watches more often. 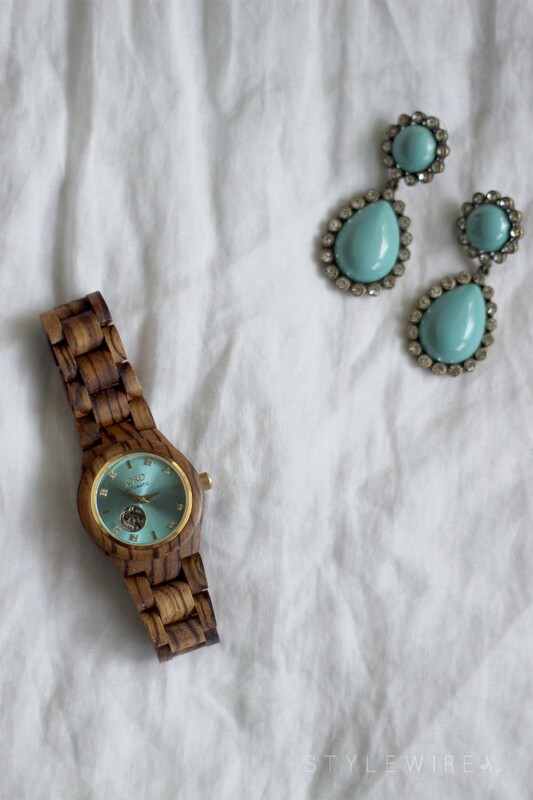 This gorgeous Cora wood watch from JORD has been the most recent and beautiful addition to my collection. It's made of a smooth, rich zebrawood and has a gorgeous gold and turquoise face with Swarvoski crystal accents. JORD was able to size my watch before shipping it out out to me so I was able to wear it as soon as it arrived. It fit perfectly right out of the box. JORD watches are quality timepieces and the wood band is certainly a unique conversation starter! I've received so many compliments when wearing it out and about. I also love the pop of color the turquoise face adds to monochromatic outfits like this linen dress and espadrille combo. Have you ever worn a wood watch? JORD has so many gorgeous colors available from deep cherry to bright blonde maple; which is your favorite?